Pros: The Bria software is a functional and reliable SIP solution with robust features. I appreciate the per station licensing, it works well in my environment where we have a bit of fluidity in seating. Configuration is relatively easy, as long as you know your SIP credentials! Configuring the headset is also very simple if the user is diligent about using the device set up utility when changing headsets or USB ports. Support for click to call handlers from third party apps is only available in this paid version, the free version (x-lite) no longer supports this. The ability to transfer to outside lines directly or with a call first option is the main factor for our continued use of this software. Cons: Customer support is difficult to reach and response for the cloud hosted version was not satisfactory. Updates to the configuration menu caused all our users calls to fail and support was uninformed about the changes and necessary configuration fixes. Individual Bria licenses should immune from such risks as the configuration is saved locally. This is a moderate concern for me, but combined with the lack of an online manual for Bria 5 online (4 was the last version available but can no longer be found on their site) I have given customer support a rating of one star. Overall: The largest benefit to this software is connivence and cost effectiveness. Bria is compatible with many third party applications and most SIP providers will offer configuration support. The combined softphone and USB headset cost is much less than a VOIP phone / headset combo and has no desktop footprint. Pros: It just works - with any hardware you're using. Whether you're on a MacBook and have a $200 headset or simply use your smartphone, Bria is by far the best softphone we ever used. Cons: They recently released a new version, Bria 5. For existing users of Bria 4, it was necessary to buy an upgrade since Bria 4 doesn't work anymore with recent Operating Systems. Overall: Besides the obligatory upgrade + smaller issues with transferring calls, my overall experience is overwhelmingly positive. We've used another softphone provider before and simply switched over completely to Bria after an endless road of issues. That road has come to an end now, and we're very happy with Bria. Pros: - You are comunicated with your people even when you are not at office. Cons: - You need internet connectivity. Overall: - Preferably it should be used with headphones to have a better experience with the clarity of sound. Thank you for taking the time to submit a review. To ensure Bria is running in the background please turn on Push? The following kbase article provides additional information that you may find useful. https://support.counterpath.com/hc/en-us/articles/115004151013-Bria-Mobile-Push-Checklist. If you encounter an issue with Bria please work with our support team. Support tickets are submitted online at support.counterpath.com. Pros: What I most like in Bria is the integration with so many devices. My headphone has support to Bria, so it is easy to answer and make calls. Cons: What I least like is the update. There is a new version that support what I need, but I have to purchase again to have access to the new functionalities. Overall: Overall, it works good. Stable and reliable are the words that explain Bria. Cons: I would like to see better outlook integration. There was a great add on which I would like replaced. When my outlook contacts were migrated many contacts are given the name "Mr" or "Mrs". This is an obvious non name field and the software should recognise it. Pros: The customer service was great to work with. Call recordings were easy to find. Cons: There is nothing I have to complain about with this software. Overall: In the last year my company moved away from using this software and I truly miss it. Unfortunately, that was not my call. Cons: In the few years that we use Bria, the functions have been changed several times, It would have been beter to inform before changing functional things. Overall: The bria gives you a freedom in usage, so you don't need a standard phone anymore. I love using it on my celphone, and on my computer. 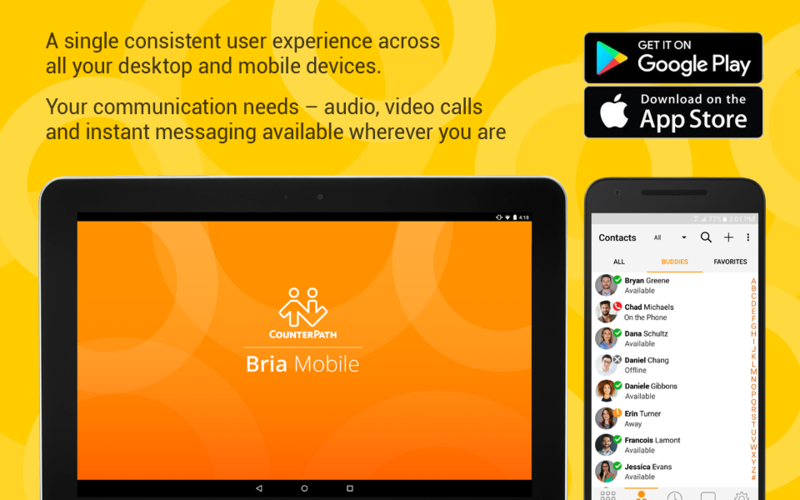 Pros: Bria allows our support staff to take, place, transfer and check calls while on the go. No need to 'connect' your cell phone to your desk phone when you can take it with you! Cons: Bria has been implemented throughout our office. The only complaint is the subscription base use now versus the one-time payment when originally purchased. Overall: Keeping my team connected makes Bria the best solution. No need for extra hardware or complicated setup. I have my office phone anytime with Bria! -Holding, Transfering and In-call features all work without flaw. -Not 100% reliable. As an organization, we have had some issues with the types of headsets that we use and their compatibility with Bria. I would recommend testing headsets before you make a larger purchase. -Inability to integrate with apple contacts easily. Overall: This is an easy to implement tool that functions out of the box. It's missing many of the bells and whistles of some of its competitors but comes at a nice price point and does the job. 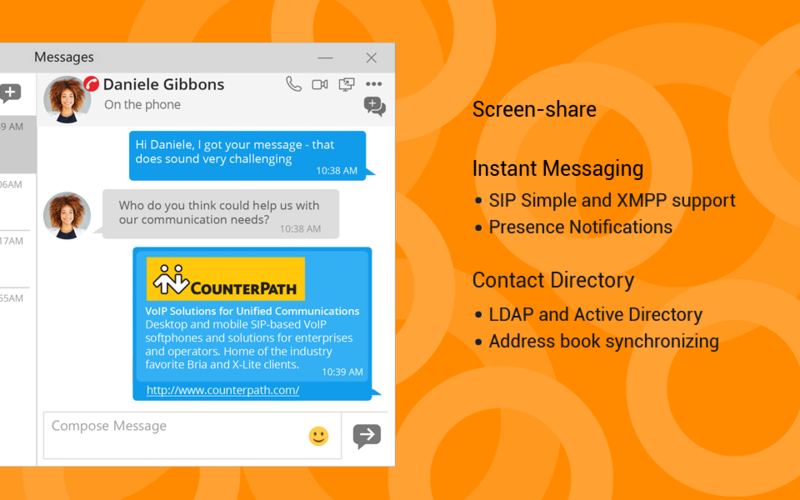 Excellent, flexible VOIP softphone ! 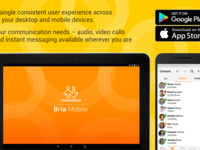 Pros: Bria is easy to use, supports call recording, conference calling and multiple phone numbers. It's also compatible with VanillaSoft and other CRM systems for click to dial outbound calling. Technical support is good. Cons: The softphone is occasionally slow to load and the on screen interface isn't particularly attractive. 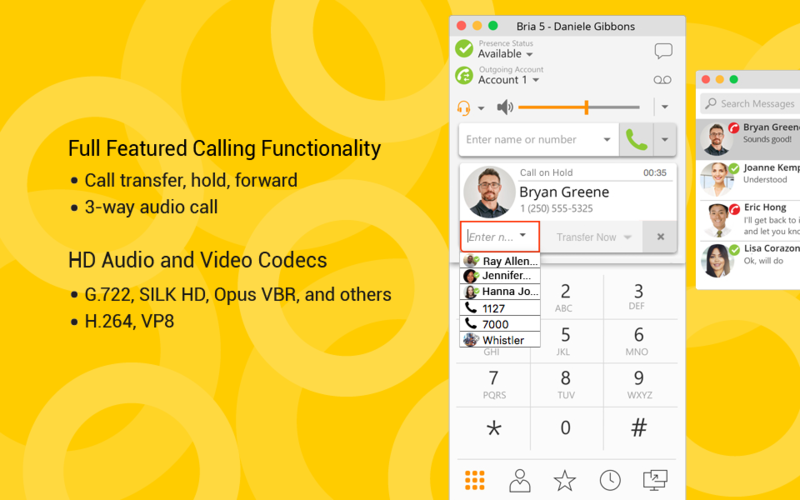 Overall: Bria is a good, flexible softphone with conference calling and recording capabilities. It's very useful for anyone who does a lot of outbound calling. Pros: This software does everything for you. All you have to do is input your id and everything is done. A call comes in, you press a button. You're done talking, you press a button. That is it. Theres also a callback feature, which we don't use but I'm sure it is just as easy. Cons: I have not had any issues with this program. Thank you for submitting a review Amber. We are happy to hear that Bria has all the features and functionality you need. Better than some softphone solutions, but not as good as a 'real' phone. Pros: Easy to install and works better on a Mac than another software does on the PC. Sound quality is okay. Works well with a headset or through computer speakers/mic. Cons: Maybe it's the nature of all soft phone solutions, but still picks up the keyboard sounds if I'm trying to use my computer and be on a call. The interface is very minimal, which some might say is a 'pro' instead of a 'con'. There's other soft phone software where the UI actually looks like a phone, which I prefer. Overall: Sound is okay, but still doesn't compare to a real, physical IP phone. The UI is minimal which will be a plus for some and a con for others. The only reason I have a Bria soft phone is that the physical IP phones my company used to use for remote users no longer work (too old for new firewall) and aren't immediately planning to replace them. I use Bria on the Mac side of my machine because it seems to work a bit better than the Cisco IP Communicator software on the Windows side of the same machine. Both have a bit of a delay when speaking, but he Bria phone seems to have a little less of it. But not sure if that's more of a PC vs Windows thing instead of a Bria vs Cisco thing. Stan thank you for taking the time to submit feedback we truly appreciate it. Pros: Very easy to use. The application is intuitive and there is little to no difficulty in learning to use it. Cons: Bluetooth compatibility is frustrating. You are limited to headsets that will work with the Bria pc application, but they don't tell you this up front. New users have no idea that you have to locate a sheet on their website that lists compatible headsets. Overall: I would say that our experience with Bria was excellent, except purchasing non-compatible headsets ate into my budget - Not Happy. Thank you for submitting a review. I apologize for any inconvenience this may of caused. I will send your feedback to the appropriate team. Bria is a great tool for incoming calls and for capturing the customers details. Pros: I like that it is just simple to use. Sign in and the calls come right in. All the customer information is displayed on the popup. Cons: The only problems I ever have with this software is that sometimes it takes several tries to get the phone to enable. Also if I am using another software, such as gotomeeting, where I have to use my microphone and headset then it will interfere and I will lose all sound until I turn Bria off and then back on. Overall: I love that it is so easy to use and I see all I need to know from my customer before I ever even speak to them. Pros: This is a great softphone that our company uses on a daily basis for the last 7 years. We love it and will keep using it. Luke thank you for submitting an amazing review. It's great to hear from customers who have been successfully using our products for several years. I'll send your suggestion for automatic call recording to the product team. Pros: BRIA is invaluable to us as a support company. Paired with USB headsets it makes Conferencing, Transfers and Outlook Contact look-ups a breeze. We are heavy users and "on the phone" all day. Cons: The only downside to using a VOIP system such as BRIA is if we lose the Windows O/S but that is a rare occurrence these days. Overall: Ease of use through headsets and softphone features. Pros: Bria doesn't use a lot of system resources and is easy to use for most callers. Doesn't require extensive system configuration and works with most anti-virus products. Cons: Crashes at least once a day for most users; not extremely stable. No click-to-dial browser extension, but has been configured for click to dial with VanillaSoft CRM in Chrome. Pros: I used this softphone in my previous company and it was okay for me. I only used basic options like call on hold and few others but the thing I liked is that it is simple to use and easy to understand. It works and I never had any issues with call quality nor crashing the program. Cons: Design can be a bit updated (maybe it was, didn't use it for some time now) but apart from that, I was satisfied. If you want more robust or complex tool, then this would not be the first choice. It's like Apple of Softphones..!! Pros: Nice interface, comparable to the competition, and is easy to setup and configure. Audio and Video qualities over the call have been taken care of pretty good. Configuring a headset is easy as well when changing USB ports too. Cons: Its paid and has plans and offers the same things which it's competition does. Customer service is difficult to reach and that disconnects me with the company totally. It did not have a build for Ubuntu customers the last time i checked which was huge let down. Pros: This software is perfect. It's cheap, full of features and stable. I use it with a Grandstream PBX with no problem at all. Cons: There is an Outlook plugin that I purchase and don't use. Most people can do without. Eric thank you for taking the time to submit a fantastic review. It's great that our software is affordable, stable and full of features. Pros: Bria is a good softphone, it works well and has a very simple interface. Cons: It is a good product, at a premium price. A bit overpriced, especially compared to other offerings. We appreciate you taking the time to submit a review. We are happy to hear that Bria works well and you find the interface simple. I will forward your pricing feedback to our product group. Cons: It has no versions for linux, android. This is very important is an excellent softphone should be released free versions for different distros. Overall: as regards the utility in Windows, it is excellent ... only that there is no for Linux and IOS, Android Etc. Thank you for submitting a review. It's great to hear that x-lite has the functionality you need. I will forward your feedback to our product team. 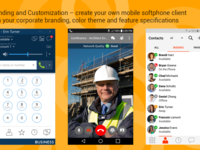 A great softphone software from a novice user to a call center floor deployment. Pros: It has a robust configuration (You can adjust one or several users at a time), works well if you have new users. The admin can make all of the adjustments on the server side. Cons: Sorry, the only thing that I could think of would be if the cost per license went down some. Then it would be great. Pros: The setup was very easy even without prior VoIP setup knowledge. No delay or lag when compared to desk phone and calls going through. Cons: It does use a lot of battery life, but the pros outweigh this. As long as you keep a charger at your desk then you will be covered. Cons: The connection to prospect to can take a bit too long sometimes however not much of a big deal. All is all good dialer. 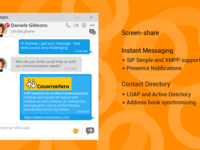 Pros: I have been using Counterpath (Bria) for many years - I mainly use the product to contact clients when out of the office with my laptop. I use the cell phone app so my clients do not have my cell number as it shows as if I am calling from my office. I never have problems so customer support has not been an issue. Cons: Set up a tiny bit difficult if you don't have a good phone service to help you with the codes. Set up a tiny bit difficult if you don't have a good phone service to help you with the codes. Set up a tiny bit difficult if you don't have a good phone service to help you with the codes. For the man about town. Pros: If you work outside the office, but still need the access and appearance that you are in the office, this app will be helpful. Replicating a VoIP desk phone's extension onto your mobile telephone becomes relatively easy. You can take and make calls as if you right at your desk. 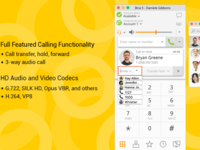 And to top it off the app is free; you get to extend the functionality of a VoIP phone to your mobile phone. Which is also great if you have limited minutes but unlimited data. Cons: The set-up does require that you know what you are doing. Having and being comfortable with retrieving the necessary telephony information is a must. The app is power hungry and push notifications are unavailable. Depending on whether your phone in the lock screen, or if the app is in the background, it can fail to appear . IF it is up and in use, it will rarely fail. Overall: It was an easy way for people to extend their office VoIP phones onto their mobile phones. It may not have the best reliability but it does work. Best for outbound calling. Philip thank you for taking the time to submit a review we appreciate your feedback. Pros: Easy to use and to setup, and works without having to poke around in the configuration settings. I use it with multiple VoIP providers which each have their own idiosyncrasies, and they all work seamlessly. Cons: On a Mac I would like to be able to hide it to the system menu. It would be nice if the licence supported use on both Windows and MacOS so that I could use it in Boot Camp too. The software is very clean and has a fairly intuitive interface, but some may prefer to be able to customise it a bit more. Overall: It's just easy to use and set-up. Simple as that. Great simple, easy to use communication tool. Pros: Bria is great - it's pretty easy to install and re-install as needed. We all work remotely 3-4 days a week and Bria allows us to maintain connected to our phones and customers without needing anything more than a laptop. Cons: Occasionally the app can be glitchy and calls do drop from time to time, but it is hard to say if that's a Bria issue or a general customer issue. Pros: They have a free and paid version of the software they both work great. Allows every means of communication. Cons: This does the job as a softphone and executes it perfectly. Really no cons that I have found at this moment. Pros: Easy to login and retrieve messages, messages are also forwarded via email so you don't forget to check. Recent history of calls is useful and ability to return a call from the history list. Cons: When checking voicemail messages, I get to a point when I have listened to a message and saved it for later - the option to move to the next message is no longer available and I have to hang up and dial back into the system. Would like History to go back further than 2 weeks - at least 45 days would be great. Pros: I like the Quality of the phone as well as the design. We use the Bria5 version. Its got all the features that I think a softphone should have. Cons: No Customer Service. Where is the API to let us integrate it further? We should be able to turn this phone into an automate dialer but without API that is a bit difficult to do. 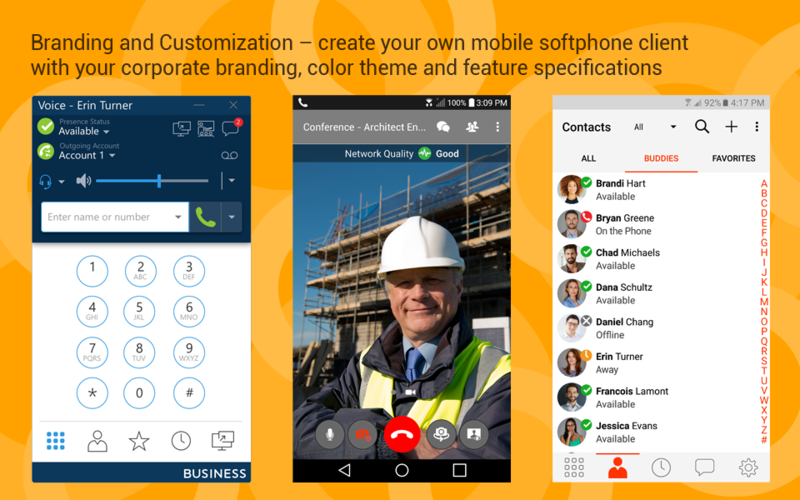 Pros: Minimalistic layout, simplified tools for the novice use, seamless integration with VoIP services. Customer service outstanding. Cons: Help features may be a bit vague or not inclusive of all features/needs or easy to navigate. Thank you for taking the time to submit a fantastic review Mary. I will forward your feedback to the appropriate team. Pros: Bria in combination with a SIP provider allows you to use your iPad as a phone -- functionality that should have been built into the iPad to begin with. Cons: The installation process is completely opaque. If you can somehow figure it out on your own, fine, but there's almost no information online about the problems you are likely to encounter and no phone support whatsoever if something goes wrong. Overall: Meh. Lots of dropped and missed calls. Ability to text is extremely erratic. If you port your old phone number -- which of course you would do if the point was to replace your phone with an iPad -- good luck! You are apparently the first human being to ever attempt this and neither Bria nor 1-VOIP has an idea how to help you through the process. Thank you for submitting a review Marion. It can be very confusing for customers. Who should address your questions the service provider or Bria. We can help you set up Bria. You will need to reach out to your service provider for the following information domain, sip user extension, sip password. Unfortunately not all providers use same terminology. Support ticket 18178 you mentioned missed and drop calls. Support has requested a call log to determine the cause please follow the steps below. Go to Bria's Settings > Advanced Settings. Scroll down to Application Logging. Verbose Logging should be turned ON. Recreate the issue and then press Send Log. You will be prompted with a confirmation dialog - tap Yes. Once the log file has been uploaded, you will see a Sending Log Success notification that has a Reference #. Please be sure to note this reference number in your support ticket 18178. Porting phone numbers and SIP information is handled by the service provider. Cons: i need google sync, so that i can integrate my google contacts. Pros: It's easy to configure and the quality of the calls is great. It's compatible with my IPBX (MyVoice 5000). Cons: The Android and PC Apps are not synchronised. When I receive a call my PC and my Android phone ring simultaneously that's good. But If I take the call with my PC for example the same call is mentionned as lost on my Android phone. It's not really great because it's not the reality. Cons: Not end user friendly. I think you need to be tech to program this so it works correctly. Thank you for submitting a review. It's great to hear Bria works well with different service providers. We continue to improve the ease of use. Customer feedback helps us identify areas of focus. Cons: price it could be cheaper for companies. Pros: This is a great softphone app that comes in both free and paid versions. 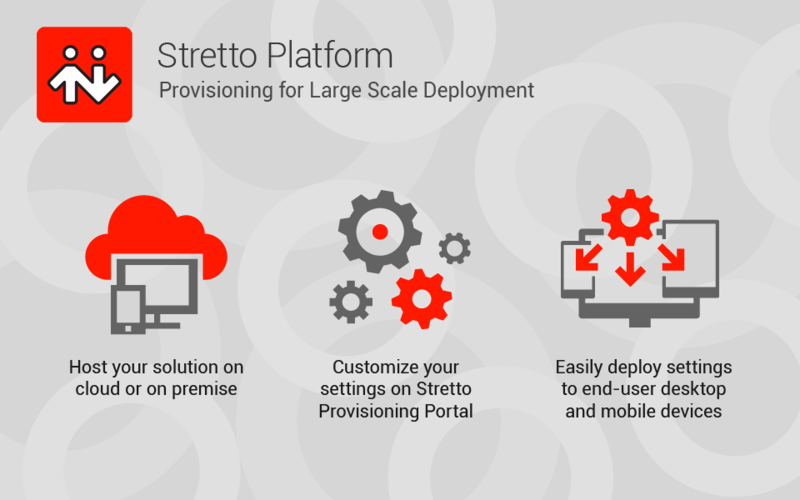 The feature set is quite robust and you have the ability to connect it to almost any SIP service you like (which is great for users who have their own SIP server). Cons: Really no major cons so far. Configuration details are sometimes difficult to sort out as each SIP provider is a little different, but it just takes a little searching to find the details most times. Pros: When working in outsourcing you need to have the right tools to help your customer base. This tool has helped us reach to them without worrying too much about our location. Cons: Some features might not be available on the tool itself and you will have to find third parties to add those features. Overall: As of now we have been able to scale our operations and continue to support our needs from abroad. Thank you for taking the time to submit a fantastic review. It's great to hear that Bria is helping customer support connect with your customers. What type of features do you feel we are missing? As our products continue to evolve our product team gathers feature and functionality suggestions from users. Features suggestions might be added to our road map for future releases. Pros: I used this app for calling customers remotely since it was a simple interface that took almost no time to learn. It got the job done without crashing. Cons: After an upgrade Bria had, it changed the ability I had to remotely connect to the app. It took weeks of discussion with our IT and Bria's IT to figure out this would no longer be a viable source to use to connect with customers remotely any longer, which was pretty frustrating to now have to make a switch to a new alternative and have to learn that new interface. This also took up 1-2 GB of space on the phone...that's pretty big. Thank you for taking the time to submit a review. I will forward your feedback to our Product Team. Thank you for taking the time to submit wonderful review Hussien. It's always great to hear ease of use when setting up profiles and SIP configurations within Bria. Pros: Very easy for end users to set up themselves without too much remote intervention. Great customer support. All around great software and company. Cons: There's really nothing I can think of at all. It's nice to hear you've had a good experience with our support team. I'll be sure to pass along the feedback. Bria 4 had good features, we've been disappointed with the support and approach to upgrades. Pros: Codec support, integration with other products. Support for Sennheiser headsets was welcome. Windows 10 support also finally got there. Cons: Quality of upgrades has been spotty - sometimes great, other times not so great. It took a while for Bria 4 notifications to work well in Windows 10. And again, we do not care for the 70% of retail upgrade policy. We'd rather pay 20% a year for support and upgrades - given the overall cost of the software, even 25% would work. Also don't like being pushed to sign-in with Linked-In for this survey. Pros: We use Bria for our call center and is a great software. Easy to use. I love the fact that im able to see which agents are online and taking calls. Pros: Good pricing (Bria retail), easy, design, Windows but also other os. Easy video integration. Webpage integration. 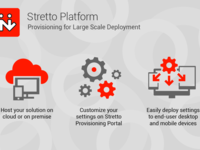 Cons: New stretto model because of the monthly fee. Mobile version is changed with a monthly fee as well.